2019 is a very powerful year, the year that will completely change everything! If You’re ready for greater love, career success, more financial abundance, deeper spiritual connection and more emotional fulfillment. If you’re ready to live your soul’s purpose and sing your soul’s song! Then this is your year. And Now is your time, because 2019 is a year of renewal and joy! The truth is, you have so much within you that is waiting to be shared with the world. This next year is crucial for you to take divine action so you can fulfill your soul’s mission. Because we are preparing for an even bigger year in 2020! How exciting to start this momentous year with two powerful eclipses! We had our first on January 5th and out next one on January 20th. Which was a Full Lunar Super Blood Moon Eclipse in the sign of Leo. Leo is the sign that lifts up, lights up and fires up. Leo invites you to EXPRESS yourself with the utmost passion. Your Soul will be more fired up than ever to fulfill your Divine destiny and Soul’s Mission. Everything you have been going through these past few years has led you up to this point. This is the third of five consecutive Full Moons we are going to have at 00°. Which signifies a Reset Point. Somewhere in your life you are pressing the Reset Button and starting a new endeavor, way of life, relationship, etc..
What is being Reset in your life now? If you’re not clear on that yet, take today to look within to find that out. Eclipses bring to the forefront those issues that we were blind to and that we need to let go of. We were being prepared for the Eclipse on January 19th, because 19/1 or 1/19 is a directive from the Universe to consciously release aspects of your past so you can begin a brand new way of being. The eclipses that mark the beginning of this year are initiating that change for us. All year, this will be a theme – letting go of your self-imposed limitations so you can soar higher than you’ve previously dreamed possible and finally live out your Soul Print– your Soul’s Mission and Purpose. Use this passionate, masculine energy of Leo to your advantage to do so. 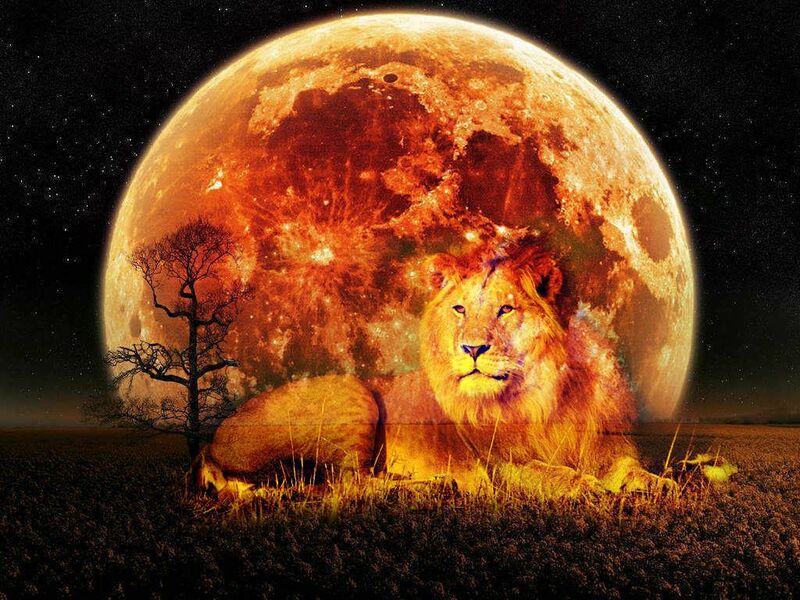 We are being asked to step powerfully and profoundly into our sense of heart-centered leadership and personal self-expression, in a very masculine, extroverted fashion with this Leo Full Moon. Yet, the path we are being asked to tread into the future, is pure feminine, with the North Node being in Cancer. What a perfect fire/water polarity set-up! Personally, we must pick up the fire of our own passions and take action, so that we might serve the planet with the consciousness of water- that is the element of the Divine Feminine. Both elements are fully present in this eclipse. If we do not move in the direction of elevating the Divine Feminine, we will be heading into deep trouble as a planet. Thus, this shake up and wake up of our Spiritual Essence and gifts and of the Divine Feminine within each of us. And the greater news is, Venus is here too, conjuncting Jupiter in Sagittarius as part of this eclipse, which is a great thing! Venus and Jupiter coming together is a boon every time that it happens, approximately once every two years. The love in Venus and the limitless bounty of Jupiter are the best of what our solar system has to offer us. And to add, the benefit of them being in the sign of Sagittarius which is all about uplifting others and bringing joy to the world! So that is what we are being ignited and invited to do! So with Capricorn in the house in this Universal 3 year, with all these powerful Eclipses to help us clear out our past, blocks and limitations, and the waking up of our Soul’s Essence to our Soul’s Purpose and Mission, and the additional boon of the high vibrational support of Venus and Jupiter in Sagittarius, we are well equipped to step into SoulPrint and Sing Our Soul’s Song! Are you excited? Are you ready? I am! Well let’s get to work and get started! We have a lot of light we need to shine upon this world! If you found this post inspiring and valuable, please share it with others! Cheers To A Much Better New Year!